The Aberdeen AberSAN-FC Kit is a Fibre Channel storage area network (SAN) package that provides virtually unlimited storage expansion via incremental additions of Aberdeen XDAS RAID expansion subsystems. The AberSAN-FC provides the building blocks to achieve future storage expansion for environments with mission critical and high-bandwidth applications. By delivering a high-performance, high-capacity storage solution, the AberSAN-FC offers customers a flexible low-cost, low-maintenance Fibre storage area network. 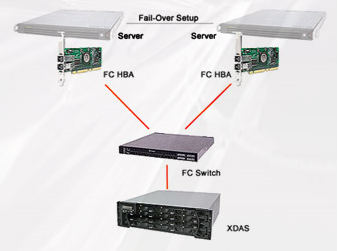 A key advantage to the XDAS is it takes advantage of disk-to-disk SATA storage via Fibre Channel connection and can be daisy-chained to provide larger storage capacities. Purpose-built for high volume storage, the innovative AberSAN-FC reduces the cost of building from 4TB up to 180TB in a consolidated storage array system from a single Fibre switch with all the benefits of an enterprise-class SAN solution. For maximum storage availability additional Fibre switches can be easily integrated into the array to surpass 1PB (1 petabyte) of storage. The scalability of the AberSAN-FC Kit dramatically lowers the Total Cost of Ownership (TCO) and is backed by an industry leading 5-year warranty to ensure maximum investment protection. Choose the appropriate Fibre kit that best suites your storage scalability needs.